Certainly the Toughest Ultramarathon of Your Life | RUN! RUN! RUN! Runner or refugee? Sport or blood sport? Leeds College of Art Acquisition. 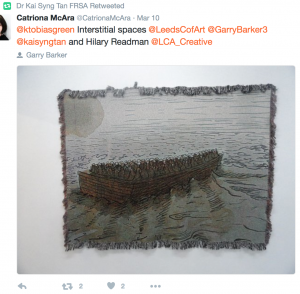 Tapestry by Garry Barker also responding to the refugee crisis, exhibited along the same corridor at Leeds College of Art. 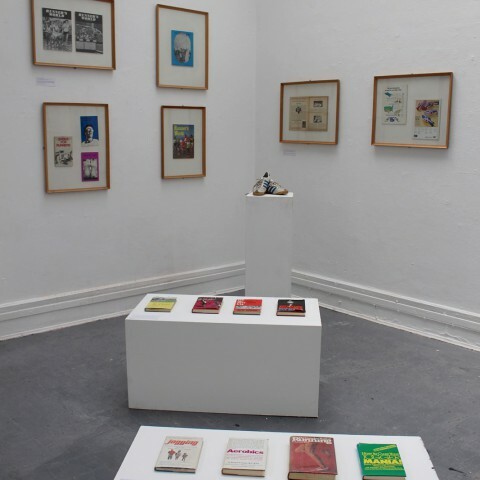 Tweet by curator Dr Catriona McAra. Migrant and/or Marathoner? Runner and/or Refugee? Escapee and/or Escapist? Who has the right to — and freedom of — movement? 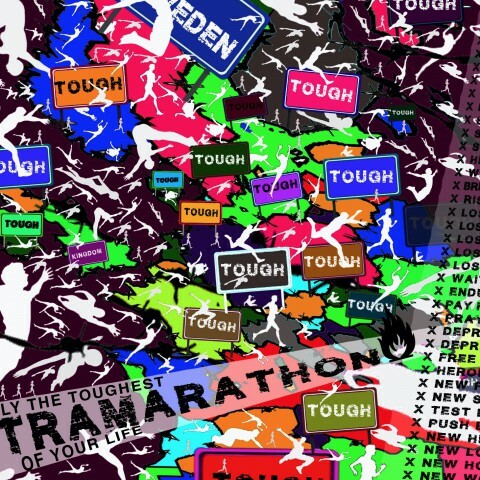 By drawing a satirical parallel between the gruelling (and exorbitant) journeys that migrants undertake to seek asylum in Europe, with the gruelling (and exorbitant) endurance races that niche but expanding groups of people from the ‘first world’ subject themselves to in the name of fitness, adventure or self-fulfillment, Certainly the Toughest UltraMarathon of Your Life critiques the demonization of migrants by mainstream media and Nimbies. In November, the map premiered at the Being Human Festival at Leeds College of Art. 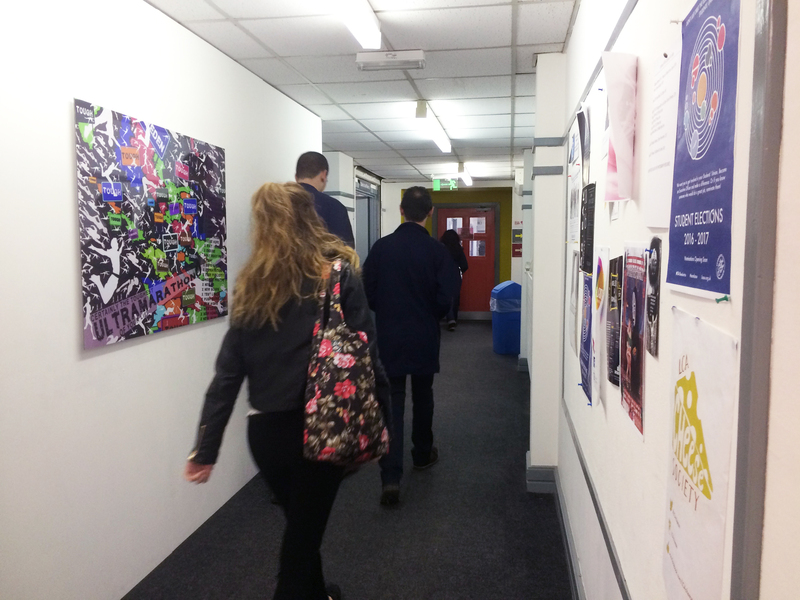 It has been acquired by the Leeds College of Art and is currently (from January 2016) on display in a high-traffic area in the College (below). 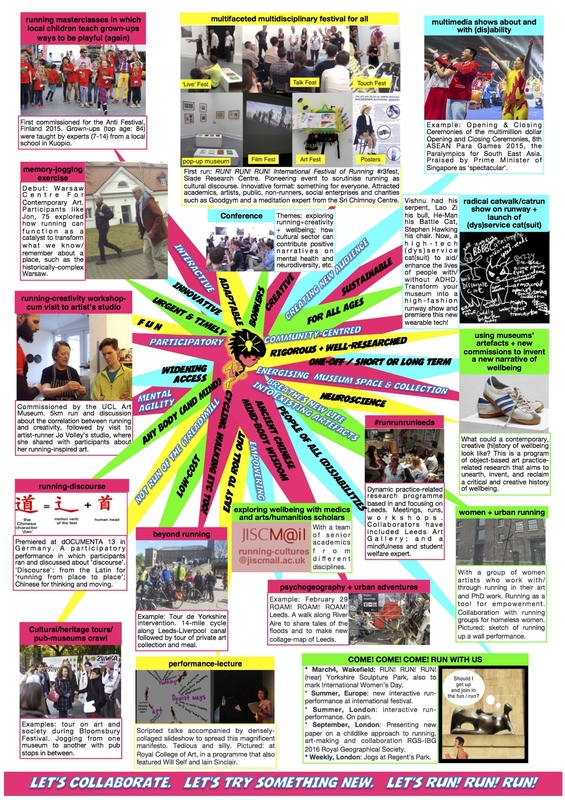 This map draws a satirical parallel between the gruelling (and exorbitant) journeys that migrants undertake to seek asylum in Europe, with the gruelling (and exorbitant) endurance races that niche but expanding groups of people from the ‘first world’ subject themselves to in the name of fitness, adventure or self-fulfilment. 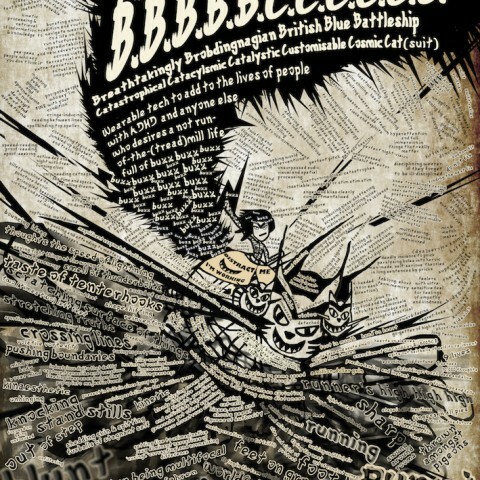 Based on a basic map of Africa-Europe, this artist’s map shows the (often middle-class) European ‘warriors’ making the heroic moves — except that instead of Tough Mudder, Marathon des Sables and suchlike at man-made fantasy theme parks or exotic deserts in the ‘third world’, they are making the perilous crossings over the sea (in deep red) and jumping over (or crawling under) physical (and metaphorical) barbed-wired hurdles and roadblocks, across different ‘zones’ for different challenges cheerfully marked out in various gaudy colours for easy identification and convenience of the participants, who would have paid (quite) a bit of money to take part in such ‘first world’ rituals of mass voluntary suffering. How different, or/and similar, are these people from, for instance, the hundreds of Syrians, Afghans and Somalis who walked 150-miles from Hungary to Austria (not to mention the other epic, extreme ‘adventures’ before that, courtesy of their well-heeled human traffickers?) Or the fit men and women who run after, and get on board, trucks to enter the (United) Kingdom? Or that solitary female who swam 21 miles across the Channel wearing her wet suit, feeding from gel — but who’d paid the ultimate price, by dying (The Telegraph, 2012; The Guardian, 2014)? The intention of such a juxtaposition or rather mash-up is to provoke us to re-think and re-imagine the (anti)migrant crisis. Migrants are lazily demonised by mainstream media and Nimbies, who have forgotten that we are all migrants. As a migrant as well as a distance runner who has taken part in such races herself, Kai wants to question our own hypocrisies and double-standards. 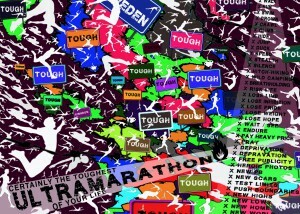 Hence, the map takes after the aesthetics of a poster for the next endurance event. The tone is mocking, grotesque, paradoxical, self-conscious, artificial, caricatural, theatrical and over-the-top! There are searchlights, the colours are plastic, the figures ready-made athletic poses downloaded (royalty-free!) from the internet and repeated, digitally, endlessly, senselessly, decoratively, vainly, in vain. And why wouldn’t you. Within Sweden there is Eden; with all that suffering comes the ultimate freedom/kingdom (actual or imagined). This work has been inspired by artist Omer Fast’s Nostalgia. Kai would also like to thank Richard Wright for his inspiration and feedback. Mapping has been a major part of Kai’s work in the last twenty years (in the forms for instance of artist’s maps, concept maps; in film via montage, or in space in the form of installation) as a critical and creative mode of enquiry and to challenge dominant narratives. Being dyspraxic, her maps have also functioned as a methodology for her to process, un-pack and re-order the/her world, in order to navigate, make sense of — and even change — it! → March 2016 addendum: Kai has just encountered Dr Debbie Lisle (Queen’s University, Belfast)’s powerfully-provocative article, Exotic endurance: Tourism, fitness and the Marathon des Sables, which draws a persuasive link between the Marathon Des Sables and the ‘reproduction of colonial tendencies’ and articulates some of the anxieties that this work attempts to portray. 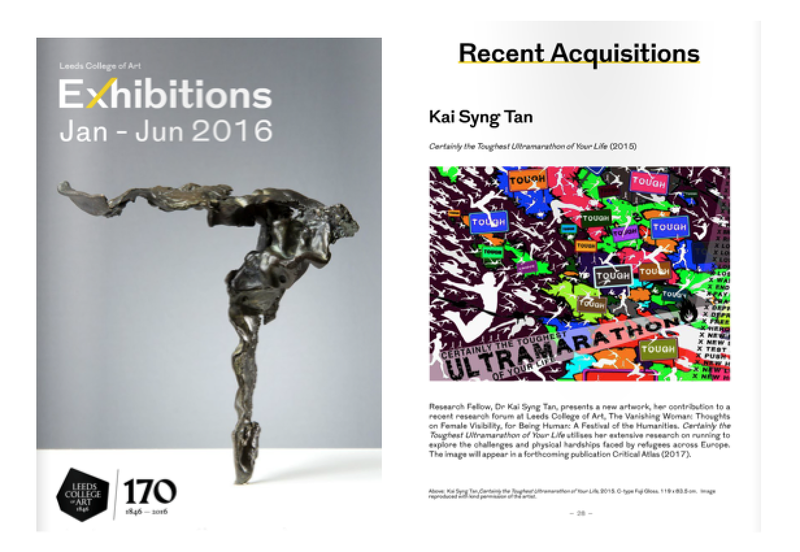 Above: screenshots of Leeds College of Art Gallery publication cover and page.